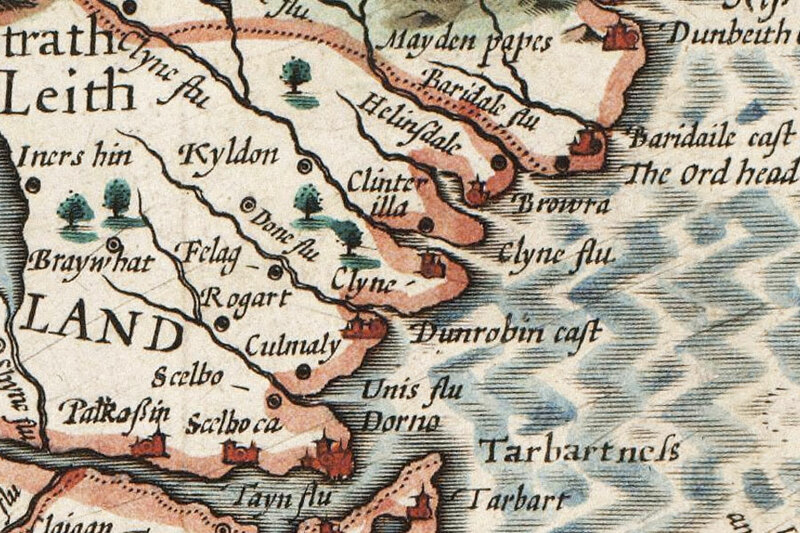 The Clyne family were closely connected to the Earls of Sutherland as far back as the 14th century, and took their name from their seat of Clyne, nothing of which now remains. The exact site of Clyne is unknown, however it is likely that it is not too far away from the old church of Clyne, which is first mentioned in records from the early 13th century. For now I have placed it at Clyne manse, also known as Balranald House, which was built in 1775 on a large raised mound on which the church also stands. 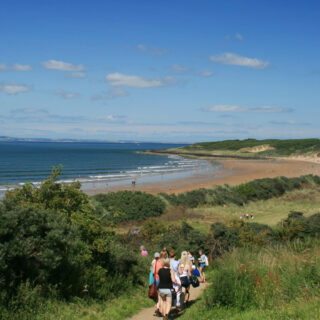 Nothing much is written about a castle or house at Clyne, but the family described as “of Clyne” first appear in records from the early 14th century witnessing charters for the Earls of Sutherland from Dunrobin Castle further down the coast. I haven’t found any references to Clyne before the early 14th century, which suggests that it may have been built in the 13th century, around the same time as the church. Interestingly there is the site of a supposed motte and bailey castle further south within the parish of Clyne at Castle Hill. Motte and bailey castles were largely superseded by other designs around the end of the 13th century, so it’s tempting to link the abandonment of Castle Hill with the foundation of Clyne. However that is entirely conjecture on my part, as there is very little in the way of evidence to back this up. What is clear is that Clyne is pictured on early maps from the 16th and 17th centuries. Many of these show the castle of Clyne in between two rivers, the more northerly of which is the River Brora. On Abraham Ortelius’ map, originally engraved in 1573, there is a castle symbol with the name Cleÿne in between two rivers. The northern river is the Brora, while the southern river is named Cleÿn, possibly the Clyne Burn, although the Clyne Burn isn’t comparable to the major river depicted. Some 34 years later Clyne is shown in the same place on William Hole’s map published in 1607, and interestingly this time it’s marked with a castle symbol coloured in red representing that it’s an important castle. The early maps are full of mistakes and discrepancies however, so it is difficult to rely on them for exact locations. 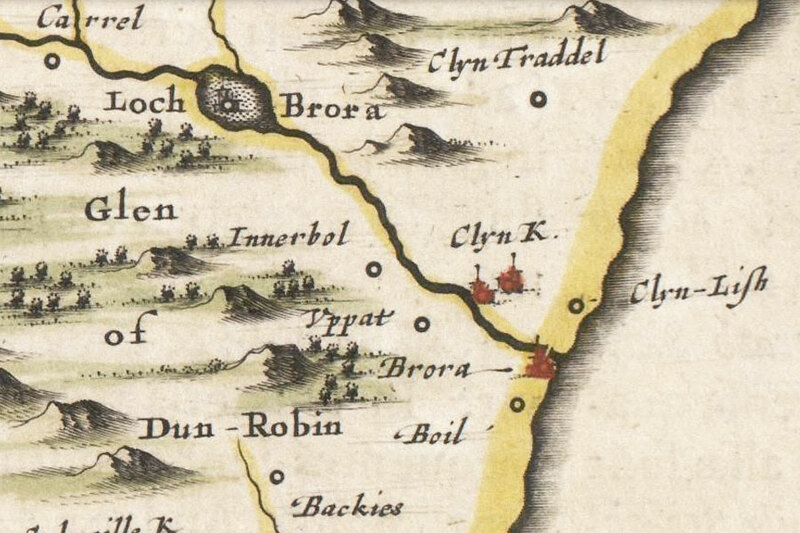 Maps from later in the 17th century almost exclusively show Clyne to the north of the River Brora. 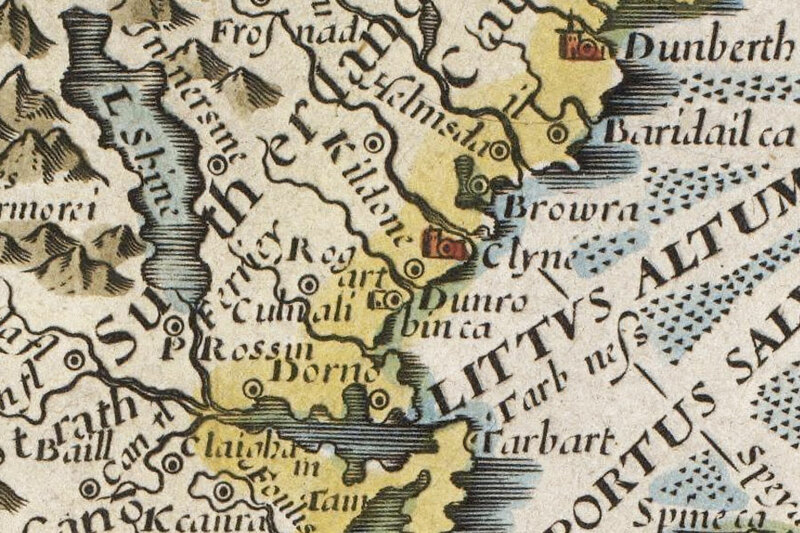 Joan Blaeu’s map of Southerlandia (Sutherland) shows two castle-like symbols named “Clyn K” in close proximity to one another north of what is presumably the River Brora. These perhaps signify the church at Clynekirkton along with the castle of Clyne. 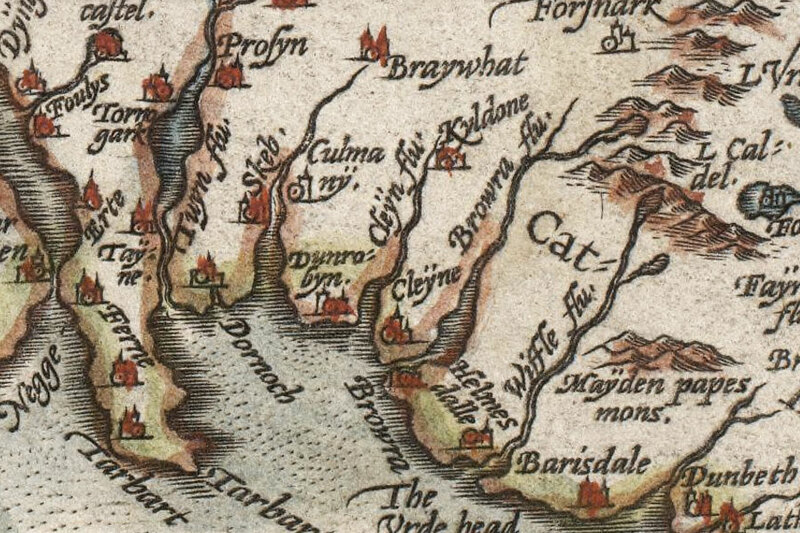 Clyne isn’t marked on Roy’s map from the mid-18th century (although Clynelish is). 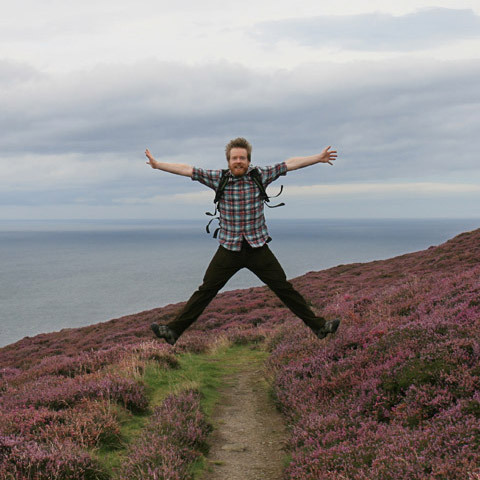 The Clyne family were closely connected to the Earls of Sutherland as far back as the 14th century, and there are many references to them witnessing charters. The earliest mention of a member of the Clyne family is to Sir William Clyne in 1315. A William of Clyne (Willelmo de Clyne), possibly the same one, is mentioned in a charter of 1349 whereby William, Earl of Ross, grants the lands of Brehe (possibly Breachat via Brae and Brae-Chat, marked as the castle of Braywhat on early maps) to Adam of Wrehard, son of William of Wrehard. 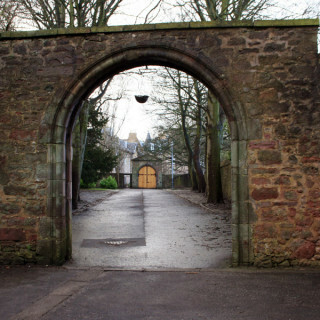 In 1477 a William Clyne of Clyne was a witness to a charter by John, Earl of Sutherland, along with Alexander Sutherland of Golspie, Neill Morray (presumably of Aberscors), and Angus Sutherland of Thorroboll (Torboll). 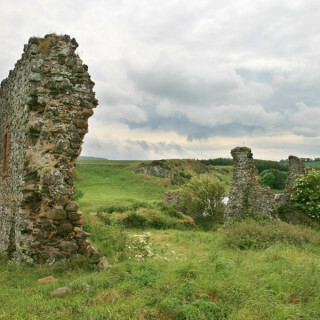 In 1518 Adam Gordon, the husband of Elizabeth, the 10th Countess of Sutherland, offered Janet and Elizabeth Clyne, heiresses of William Clyne of Clyne, to the sons of John Moray of Aberscors for marriage, as a reward for Moray’s loyalty during a Clan Sutherland dispute. 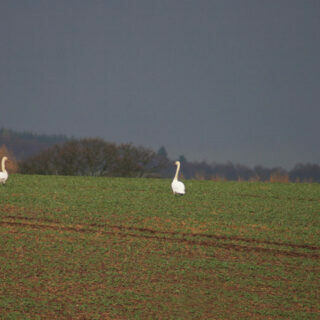 However Moray didn’t accept, although the reason why is unknown. Instead one of the Clyne heiresses married a Sutherland, and Clyne came into the Sutherland family. 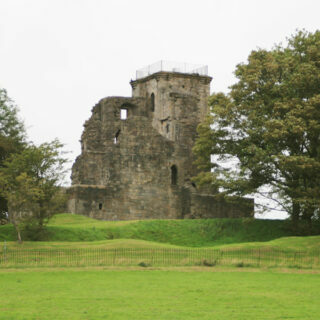 Later in the 16th century John Sutherland, the third son of William Sutherland, 9th of Duffus, inherited Clyne and became known as John Sutherland of Clyne. 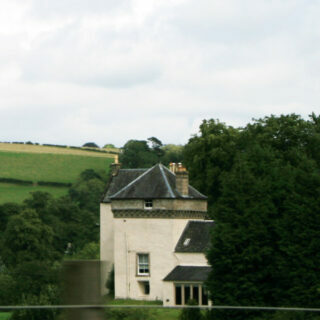 in 1697 his grandson James inherited Clyne from his father, also John, and in 1704 inherited the lands of Clyne-Kirkton. In a book published in 1908 but written by Walter Macfarlane around 1750 “Clyn” is included in a list of “castles and piles of Sutherland”. While several things are unclear, it seems to me that the original castle of Clyne could have been on what is now known as Castle Hill until some time in the 13th century, when the focus switched to Clyne across the River Brora. It is tempting to suggest that the Clyne manse is either built on the site of, or perhaps even incorporates part of, a later castle or house of Clyne, although again it is completely unclear if this is the case or not. Clyne is in the parish of Clyne and the county of Sutherland. Published on the 26th of April 2013 at 12:00 am. Updated on the 26th of April 2013 at 12:00 am.